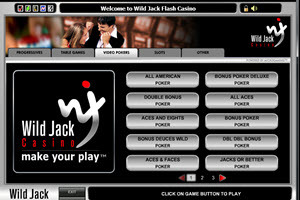 Wild Jack Casino has a long established history online. First opening more than 10 years ago, Wild Jack is a great choice for those who enjoy reliable, exciting casino games and are looking for a sophisticated casino. 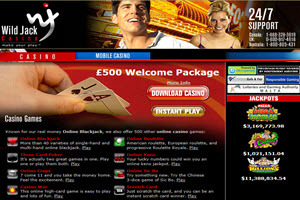 The casino operates with the Microgaming software and includes download, instant play and mobile software. The casino is the perfect destination for anyone that loves blackjack though just as easily it can be a great casino for those that enjoy slots or any other casino game. There are about 30 different game categories at the casino and these encompass over 500 games. The license under which this casino operates is issued in Malta, and the casino is eCOGRA compliant and proudly display this on their website. Among the many games that the casino offers you will find the game of blackjack, in 40 different variants, plus more than 300 slot machines, craps, baccarat, roulette, Sic Bo, scratch cards, video poker, keno and many others. Those that enjoy blackjack now have the opportunity to play this game, and to do it largely with the help of the bonuses that the casino has to offer. Wild Jack offers bonuses both to new and existing players. When registering with the casino you will be entitled and receive a welcome package worth as much as $500 along with other perks such as special promotions, loyally points and a VIP room. • Welcome package worth up to $500. This is spread out over four deposit – 100% up to $/€/£200, 25% up to $/€/£100, 50% up to $/€/£100 and 25% up to $/€/£100. Microgaming is a powerful name in the casino game market as they are known for offering the biggest selection of titles and some of the best games around. They’ve been active since the 90’s and with that much experience comes a knowledge that they’re doing things right. The software gives multiple choices with those being downloadable software and an Instant Play version. While the Instant Play is easier to get started with, there are only 300 titles, so you will have fewer games to play. The software is secure, easy to install and is incredibly well presented. The navigating of the software is a walk in the park and this is testament to why Microgmaing ranks continually as a favored platform for online casino gaming. Wild Jack accepts different methods, both for deposits and withdrawals. There are over a dozen options provided with 8 of those allowing for the processing of deposits and withdrawals. Deposits are instant and withdrawals are processed inside of 48 hours. 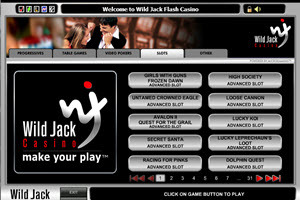 The payment methods accepted at Wild Jack Casino include Visa, Mastercard, Trustly, Skrill 1-Tap, UseMyFunds, direct bank transfer, Paysafecard, EcoCard, EntroPay, ClickandBuy, Sofort, Instadebit, Ukash, Skrill, Neteller and Click2Pay. The mark of a great casino is usually the way its players feel about it when they have a problem. When a casino does everything in its power to solve the issue, to do it in record time, and to make sure the player is happy, then you know that you’ve found a gaming establishment where it’s worth spending time at. That’s how many feel about Wild Jack casino, which offers players a well trained staff, available 24/7, via a few classic contact options.